No one plans on having their battery up and quit on them. Which is why jumper cables seem to be a rare commodity when you do have issues. Your battery was probably working fine- until it wasn’t. The hot Colorado summers can cause battery fluid evaporation which leads to a dead battery by the time winter arrives. Colder weather can slow down the chemical reaction required to start your car and prevent your battery from working up the required juice. This is why a lot of older batteries just plain work better in warmer weather and also why we find ourselves with a lot of dead batteries when the weather gets cold! But don’t worry, Denver Super Towing has got you covered. Our tow truck drivers will quickly and correctly connect the jumper cables to your vehicle to get you on the road. 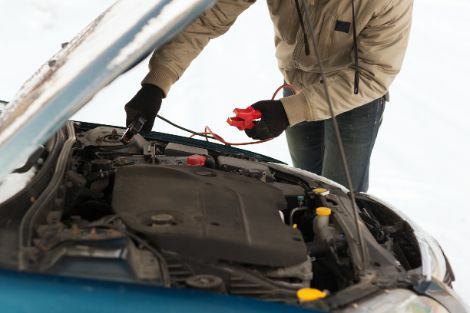 Maybe you are even well prepared with your own jumper cables but your vehicle is parked so tight you can’t connect the two batteries. We still got you covered! We can send the nearest tow truck equipped with a jump box which will allow us to jump start your battery from any angle. First off, we don't see many batteries that last more than two to three years. Sure, there are exceptions but the back and forth, hot and cold weather of metro Denver and the surrounding areas can really do a number on your battery. If your battery hasn’t been replaced in the last few years it should be a top suspect in your car troubles. You may be looking at a dead battery if you find that your engine cranks but doesn’t seem to have the power to start. While this could be a few other issues, again, your battery should be at the top of the list. If you find that the automatic lights, alarms and other features that normally function without the engine running are not working then we are almost certainly dealing with a dead battery. Give Denver Super Towing a call at 720-800-6161 and let us get you on your way! Email the Colorado Towing Experts!